Blackheads — also known as comedones — are one of the most common skin annoyances. These little black dots can pop up anywhere on the face — usually on the nose, chin, and forehead — and they seem to proliferate at an alarming rate. But perhaps the most disconcerting thing about blackheads is that they’re seemingly impossible to get rid of at home. We tapped into a handful of dermatologists to solve the mystery of blackhead removal — and as it turns out, you can nix comedones without stepping foot into a derm’s office. The first step in banishing blackheads is understanding your enemy — i.e. what actually causes the little devils in the first place. “Blackheads are technically a form of acne known as an open comedone,” explains explains Dr. Shari Marchbein, MD, a board-certified dermatologist and clinical assistant professor of dermatology at NYU School of Medicine™. “They are caused by buildup of sebum — the oil produced by [your skin’s] sebaceous glands.” When there is too much sebum, the pore appears dilated and enlarged. Once exposed to the air, this mixture of excess sebum, dirt, and bacteria oxidizes — a process that is responsible for the black color of the blackhead. Dr. Marchbein and many of the other dermatologists we spoke to recommend prescription retinoids for advanced blackhead cases, but for mild to moderate conditions, over-the-counter products that can certainly help. From nose strips and face washes to tonics and face peels, nine skincare experts share some of their top blackhead-fighting picks, below. According to board-certified dermatologist Dr. Joyce Imahiyerobo-Ip, one of the most effective ingredients for unplugging pores is salicylic acid. And, it works most effectively if it’s left on your face, not washed off. “These HydroPeptide 5X Power Peel Daily Resurfacing Pads ($68) contain a blend of acids, including salicylic acid, that you wipe onto your skin after cleansing. You then apply your moisturizer right on top [without rinsing]. This [prolonged wear] helps fight breakouts all day long,” she says. The Shiffa Tri-Acid Radiance Peel ($68) contains a cocktail of three powerful exfoliating fruit acids — glycolic, lactic, and salicylic — blended with marine extracts, hyaluronic acid, and brightening essential oils. “Salicylic and glycolic acid are stars when it comes to reducing acne, reducing the swelling associated with acne, and helping to unclog pores, which in turn helps with managing blackheads,” explains brand founder and CEO Dr. Lamees Hamdan. The treatment helps to make pores appear smaller and reduce the occurrence of blackheads over time. Try using it once a week on dry skin, or twice a week if you have combination/congested skin. While Dr. Adarsh Vijay Mudgil, MD, celebrity dermatologist and medical director at Mudgil Dermatology™, considers prescription tretinoin the gold standard when it comes to fighting blackheads, he says these nose strips from Biore ($6 for eight) can work wonders when used in conjunction with it. “Tretinoin helps to soften the contents within the blackheads themselves, as well as to prevent their future formation,” Mudgil explains. Once the skin has been primed with the prescription retinoid (which can take a few weeks), it will be easier for the strips to work their magic. “Biore strips work amazingly well to pull all the schmutz out — it’s like a perfect blackhead-busting, one-two punch!” he enthuses. Chemical exfoliants like alpha-hydroxy acids (AHA) and polyhydroxy acids (PHA) work to help clear away dead skin cells and oil to decongest pores. The Eighth Day® Facial Tonic ($85) contains both, along with lentil seed extract to refine and shrink the appearance of pores. “It works best on dull skin to exfoliate and brighten the complexion,” explains board-certified dermatologist and brand founder Tony Nakhla. Expect to see a significant reduction in sebum production, pore size, and skin roughness in less than one month of consistent use. 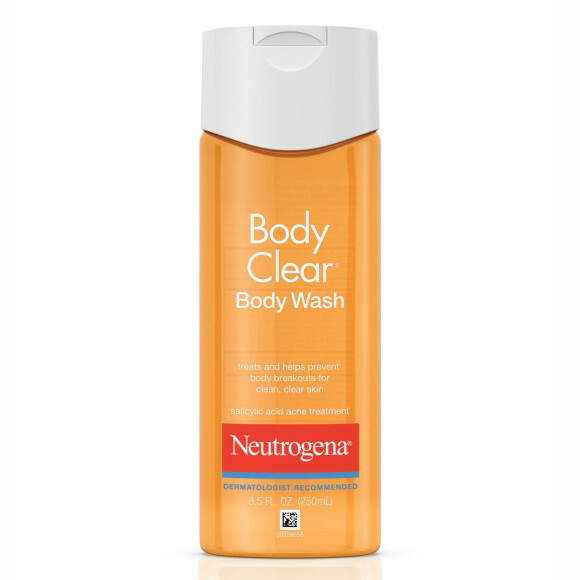 When it comes to tackling body blackheads, Dr. Iris Rubin, dermatologist and co-founder of SEEN™ Hair Care, recommends Neutrogena Body Clear Acne Body Wash ($6). “Salicylic acid is a beta hydroxy acid,” she notes. “Its purpose is to keep pores clear by preventing dead skin cells from sticking together — and helping to dissolve the intercellular cement,” she says. Dr. Rubin suggests using the product on the entire skin area that is prone to blackheads — not just where you have current breakouts — to prevent future blemishes (and seeing a dermatologist who can help for prescription medications if your blackheads persist). While Dr. Marchbein reiterates that blackheads are best treated with prescription retinoids, she suggests this over-the-counter gel from Differin ($13) for milder cases. Since even milder retinoids can cause redness and dryness, she recommends starting at three times weekly at night and then increasing to nightly as tolerated. "This is where your board-certified dermatologist can help guide you," she says. You can expect to start seeing results in as little as a six weeks, with optimal results after about two months. The Dr. Jart+ Pore Master Patch ($8) has become a go-to for Dr. Julie Russak, dermatologist and founder of the Russak Dermatology Clinic™, for its ability to both deep clean and unclog pores. Similar to how charcoal draws out impurities from pores, this product relies on coral powder to attract dirt. “As the product extracts, the sage and tea tree promote a decrease in inflammation in the cyst and comedones,” she adds. PanOxyl Acne Wash ($10) contains benzoyl peroxide, which can help reduce blackheads by breaking down the buildup that blocks pores and by killing the bacteria that lives inside them, says Dr. Hal Weitzbuch, MD, MS, FAAD, medical director at the Calabasas Dermatology Center™. “It should be used as a wash one to two times per day as tolerated and left on the skin for about five minutes before washing off,” Dr. Weitzbuch notes. “If it’s too irritating, let it sit for less time, and make sure to wash it off completely — or you might notice all of your towels have been bleached!” He recommends the product for those with milder to moderate conditions and adds that it can also help with pustular acne. Product prices may vary from the time this article was written. Allergan® may receive commission for purchases made through links in this article.